When Studio Ghibli shuttered their production in 2014, the film industry lost one of the foremost leaders in imaginative fantasy storytelling. With Hayao Miyazaki set to come out of retirement for a new Ghibli film, that loss is a temporary one, but lucky for fans of the animation studio we don’t even have to wait that long for a new film in the proud Ghibli tradition. Ghibli producer Yoshiaki Nishimura branched off to form Studio Ponoc with a team of key fellow Ghibli vets and their first feature, Mary and the Witch’s Flower is an absolutely enchanting animated adventure with some distinctly recognizable DNA. 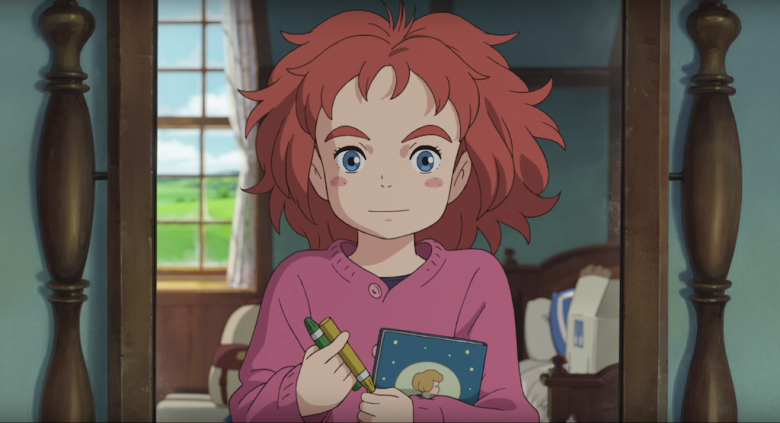 Based on Mary Stewart‘s 1971 children’s fantasy book The Little Broomstick, Mary and the Witch’s Flower comes from The Secret World of Arrietty and When Marnie Was There director Hiromasa Yonebayashi, and he conjures charming magicks once again for his latest. The film follows Mary Smith, a young girl living with her great-aunt Charlotte over the summer. Mary’s cheerful and kind, but she can never seem to do anything right. She’s always offering a helping hand, but the trouble is that hand always seems to knock something over along the way. In short, she’s a helpless klutz, but she’s always got the best intentions. She’s frustrated by her frizzy red hair, she’s frustrated by boredom in the late summer doldrums, but mostly, she’s frustrated by the fact that she’s a walking disaster. Everything changes when sees a black cat turn grey and follows the cranky feline on a forest adventure, where she discovers a magical flower and a skittish broomstick that send her on an incredible adventure. The glowing blue flower is called a Fly-by-Night or the Witch’s Flower, a rare specimen that only grows every few years and is coveted by witches — and it’s easy to understand why, because when Mary touches the flower, she suddenly possesses powerful magicks she never had before. Before long, Mary’s little broomstick takes her on a grand adventure, transporting the young girl to a magical institution where the headmistress sees Mary’s magical abilities and thinks she’s a prodigy. As the film tells us, everybody knows redheaded witches have the most power. There’s just one problem with the assumption; Mary is not a witch, and as the school’s motto informs us, trespassers will be “transformed”. The nature of that transformation remains a mystery for much of the film’s run, but accompanied by her cranky cat — an almost unbearably cute sassy companion — Mary knows she’s landed herself in a spot of trouble and it only gets worse the longer the ruse continues. There are a lot of familiar elements to Mary and the Witch’s Flower, some of them just natural tropes of the genre — like the majestic far-flung school where witches learn to harness their powers. Many of those familiar elements are a result of the Ghibli DNA, especially the film’s structure and the transition from small, rural life to wild worlds of fantasy. That world of fantasy is the film’s greatest asset; a whimsical, winsome world of invention, gorgeously translated on screen by the animation team, who makes the world rich with details and splendid imagery, especially in the second act as Mary investigates the wonderous hallways and classrooms within the magical institution, glinting gemstones, magical artifacts, and strange magical creatures always introducing a new moment of awe. There’s no shortage of fantastical invention to marvel at in Mary and the Witch’s Flower. Ultimately, the film may not have the profound resonance of Miyazaki’s best works, but it’s a proud debut for Studio Ponoc, another enchanting notch on Yonebayashi’s directorial belt, and a fine successor to the legacy of Studio Ghibli. I must admit, Mary and the Witch’s Flower feels like a film made special for my interests — witchcraft, sassy cats, redhead magic, and a well-meaning screw up in the lead — but even if you’re not interested in those oddly specific elements, it’s a family-friendly adventure with universal appeal. There’s just nothing not to like about it. Few films conjure the pure feeling of otherworldly awe and imaginative spirit quite like the Ghibli films, but Mary and the Witch’s Flower is an utterly bewitching delight. Mary and the Witch’s Flower doesn’t currently have a release date; it debuted at Fantastic Fest.